Five years ago, we started to hear about the electronic electricity meter, or eMeter. Why the interest in this technology? Well, an eMeter can report electricity usage faster, cheaper and more reliably than its traditional mechanical counterparts. The long-term cost savings for utility companies using an eMeter balances out the high cost of a system-wide infrastructure upgrade. Throw in some government assistance and incentives and the transition has become a no-brainer. The first eMeters were based on 8- or 16-bit microcontrollers (MCUs), such as the Texas Instruments (TI) ultra-low-power MSP430, with either embedded or discrete analog for electricity usage measurement (metrology) or for varied types of communication depending on geography, a utility’s other requirements and overall goals, including reductions in energy consumption. 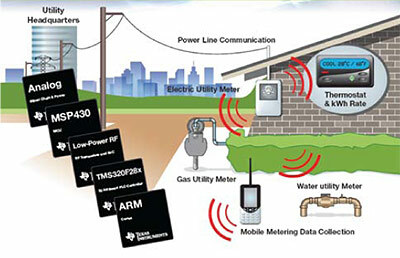 The eMeter started the revolution by simply tracking usage and reporting data back to the utility company. Today, it makes sense to combine the original electronic communication infrastructure with a smart home network to connect a variety of electronic household products offering features for both safety and convenience. With energy costs as a top concern and the proliferation of connected electronic products, the need for a connected smart home and smart meter is more pressing than ever. 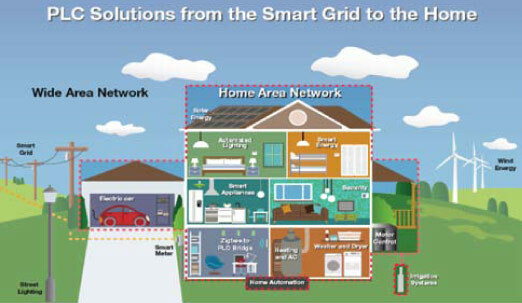 In short, the smart grid and the smart home network need to evolve to the next level to meet user demands. The list of possible connected parts within a smart home network is growing rapidly. In a quick search of the Internet, a customer can learn about a wide range of electric, water and gas meters that all offer smart connectivity. Today, commercial and consumer level products are offering features for in-home electronics that include heating, ventilation and air-conditioning (HVAC), lighting control, security, smoke alarm detection, electric vehicle chargers, and a host of smart appliances (e.g., refrigerators offering touch screens for users to monitor home energy use, surf the Internet for a recipe, or watch television). This emerging generation of connected devices joins the network of a smart home to provide the possibility of a futuristic George Jetson-like experience. Okay, maybe without Rosie the Robot (not yet, anyway). What is the potential of a truly connected smart home? A large part of that depends on the owner, but today there is work well under way on taking us toward a highly connected, user-friendly home. In areas or times when the electricity grid is strained, the utility, with permission, can reach out to homes or businesses to adjust items such as appliance usage, HVAC settings and other activities to keep from suffering rolling brown outs or having to charge peak rates. Other activities fall into the category of convenience and include such options as using your smartphone or work computer to adjust your thermostat when you are away from the house, sending an alert to you if a window has been left open and/or unlocked, or monitoring the movement of a grandparent. The possibilities with a connected smart home are endless. I know everyone has heard this before. It brings back memories of things like Disneyland’s House of the Future. But we can now make a more practical vision possible. One approach is for the eMeter to upgrade to a Smart eMeter, meaning that it transitions from working on a single network to multiple networks. In the past, a single wireless network like ZigBee or wired power line communication (PLC) was all that was needed to report back to the utility. But to achieve the ability to connect to multiple devices and actually operate those devices, it is necessary to build multiple networks on top of each other in order for the networks to communicate simultaneously. For example, Wi-Fi, sub-1.0GHz, 2.4GHz and Ethernet standards can all be used in the same system. This drives the need to run highly sophisticated software. There has been a movement to high-end real-time operating systems (RTOSs), from vendors such as Mentor Graphics and Green Hills Software, or high-level operating systems (HLOSs), such as Google’s Android, Linux and Microsoft’s Windows Embedded CE. When you combine these OSs with increased software stack sizes to accommodate these many types of communications, embedded designs are suddenly based on 32-bit MCUs, such as TI’s Stellaris ARM Cortex-M3 MCUs, with large embedded flash capacity and external memory interfaces. Or designers can even contemplate using TI’s 32-bit microprocessor (MPU) offerings, the Sitara ARM Cortex-A8 or ARM9-based MPUs. The ARM Cortex-A8 is the first processor to incorporate a variety of technologies that make it ideal for the smart home use. These include TrustZone security, the Thumb-2 instruction set and Jazelle-RCT for fast and efficient Java execution. All of these attributes as well as high flexibility and horse power make a Cortex-A8-based device an ideal fit for embedded smart home systems. Not only is ARM helping to drive the technology forward, but major semiconductor companies are contributing their technology as well. We are seeing the introduction of ‘combo ICs’ as a welcome and much-needed next step. We’ve already seen superscalar combo-processors that enable Internet-ready applications to share rich media content among a variety of devices connected to the smart home network. These combo ICs add Bluetooth/Wi-Fi and Bluetooth/WIMAX/Wi-Fi configurations to the many fascinating combinations readily available. Another driving force behind the widespread acceptance of the smart home network is the advance in security standards. The smart electric grid is not only an amazing tool and feat, but a large liability. The U.S. government is working to ensure regulations are in place to keep the grid safe from terrorists, malevolent hackers and others who may pose a threat. As the grid becomes smarter and more highly connected, it becomes a significant challenge compared with its mechanical version. A solution to resolve the security issue would be to move the smart grid to a cloud computing model. Just recently, telecoms operator Verizon announced that it has teamed up with key players in smart grid technology to offer exactly such Smart eMeter services. Moving to the cloud not only helps provide security, but the utility companies like it because of reduced upfront capital investment. When you consider the aging power distribution infrastructure in the U.S., the need to combat global warming, and the need to use all of our energy more wisely, eMetering or Smart eMeters are ideal solutions. This is particularly the case with financial backing now available from the Federal Government. In 2009, President Obama threw his weight behind a program that includes $4.5B in direct spending to modernize the current power grid networks with smart grid technologies. Additionally, a whole new generation of electric vehicles from Detroit is ready to make its grand entrance. Putting electric vehicles on the road benefits everyone—not only for the obvious environmental reasons, but electric vehicles also have the ability to even out the differences between the peaks and valleys in electricity demand, making the utility companies and rate payers much happier. As we transition from the eMeter to implementing Smart eMeters, users will be empowered with a truly connected home to save on cost, provide entertainment and daily life conveniences, and be environmentally friendly, making their own home a ‘home sweet smart home’ indeed. Sean Murphy is a manager for Focus End Equipments-Commercial Human Machine interface (HMI) in the Sitara ARM microprocessor business unit at Texas Instruments.